1. Preheat the oven to 170°C, gas mark 3. Butter and base line a 20cm ring mould cake tin. Cream the butter with the sugar and lemon zest in a large bowl until very pale and light. Gradually beat in the eggs a tablespoon at a time, adding a tablespoon of the flour if the mixture starts to split. 2. Fold in the flour with the lemon juice, soured cream and caraway seeds. Spoon into the tim and level the surface, making a shallow well in the centre with the back of a spoon. Scatter over the blueberries. 3. Bake for about 1 hour until the cake is risen and golden and a skewer comes out of the centre clean and dry. Place the tin on a wire rack and leave to cool completely. 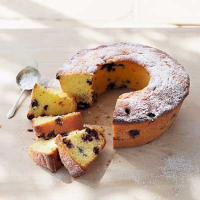 When cold, remove the cake from the tin and store in an airtight container Sprinkle with icing sugar before serving, if you wish.